The prizes are destined to render homage to the most important personalities of Romanian diplomatic life, personalities that had a long standing and positive influence in forging Romanian foreign policy and in supporting a better international image for our country. Professor dr. Anton Caragea, Director of Institute of International Relations and Economic Cooperation was hailed as the best romanian diplomat of this year, receiving the PRIZE ON VOCATION FOR INTERNATIONAL COOPERATION . In the official handing out ceremony, offering the response to the presentation made by Mr. Carol Roman, Director of Balkans and Europe Magazine, Professor Dr. Anton Caragea had taken the rostrum presenting the main highlights of his vision of Romanian foreign policy. 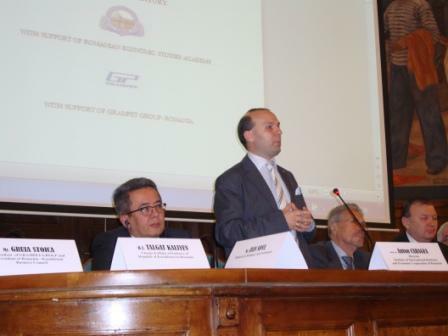 Professor dr. Anton Caragea had underlined the necessity that Romanian voice must be regarded as the voice of Europe, and when Bucharest is stating a foreign policy decision this must be also regarded as an European voice. 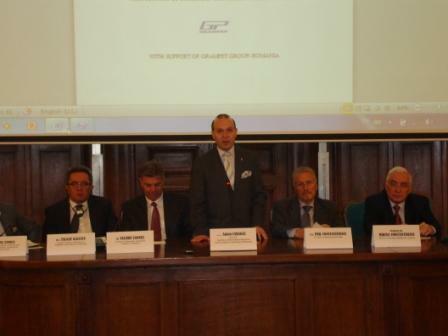 Romania is a fundamental element of European construction, concluded professor Anton Caragea. Another basic principle of foreign policy must be the necessity for Romania to forge new partnership`s, a tradition that has proven useful for Romania in the past and must be revived. The revival of this long standing tradition had transformed the foreign policy landscape of Romania as seen by the favorable examples of Romania`s relations with Kazakhstan and United Arab Emirates. 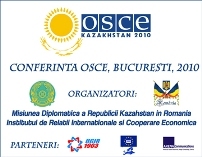 By strategic partnership with Kazakhstan, Romania was able to host in February 2010 the Preparatory Conference on OSCE reform and the theories presented in the Bucharest Conference had being transformed in key elements of the OSCE agenda of reform, debated in the High Level Astana Conference in December 2010. 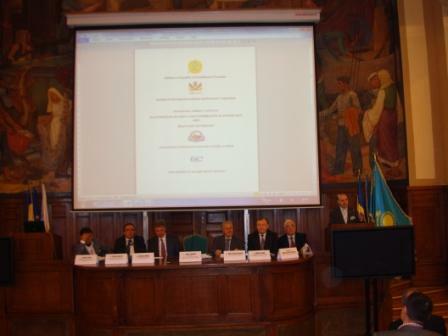 In 2011, Romania hosted the most important international conference, after the one held in Washington, to mark the independence of Kazakhstan. In 2012, Romania was the first European country to announce his support for Astana-Kazakhstan capital, as the host for EXPO 2017 international exhibition. Also in 2012, the two decades of successful diplomatic relations between Romania and Kazakhstan where celebrated with pomp and ceremony. 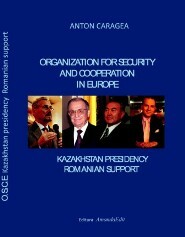 I must also emphasize on the hosting by Romania of the Conference on Security and Cooperation in Europe and Asia, in November 2012, occasion for the Romanian elite to express his staunch support for the Kazakhstan President-Nursultan Nazarbayev, plan to forge an area of security and cooperation between Europe and Asia. This are just a few moments of a bilateral relation that must be regarded as an example for the future of Romanian foreign policy, concluded his allocution professor A. Caragea. Accompanied by thunderous applause of the assistance, professor dr.Anton Caragea had received the PRIZE ON VOCATION FOR INTERNATIONAL COOPERATION as a statement of appreciation for his lofty diplomatic activity. On this occasion where also honored, for their role on bilateral relations development, the Ambassador of Peoples Republic of China Mrs. Huo Yuzhen , Ambassador of Bulgaria Mr. Aleksandar Filipov and Ambassador of United States to Romania etc. The PRIZE ON VOCATION FOR INTERNATIONAL COOPERATION was previously received by: Macedonian President-Boris Trajkovski, Azerbaijan President: Ilham Aliyev and Greece Prime Minister, Constantinos Simitis. Today we are witnessing a historic moment in the opening of the International Conference on Permanent neutrality ofTurkmenistan: cooperation for the sake of peace, security and development, in the historical city ofAshgabatand I said this in full knowledge as this event marks a series of important moments. I will like to emphasize just a few of the arguments that underline the historical significance of this conference. First it is to be appreciated that such an international event is held under the supervision and guidance of H.E. 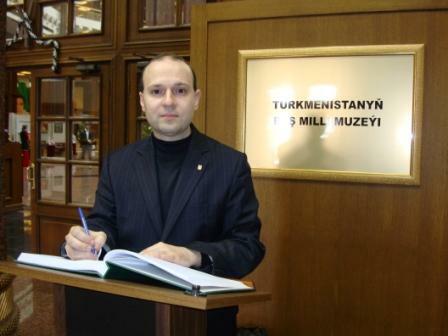 President ofTurkmenistanMr. 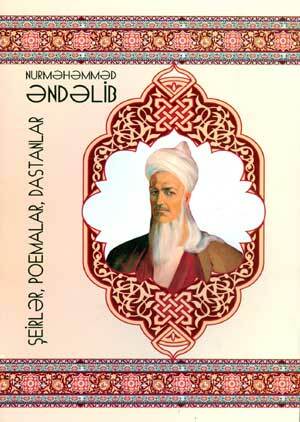 Gurbanguly Berdimuhamedov. This is to be commended as this is showing the necessary political support for discussing and researching the declaration of neutrality of Turkmenistan and is also proving without equivocation that, decision of taking Turkmenistan on the road for upholding a neutrality path to development and international relations is a long term decision, with the support of the highest decision maker in the country. This is demonstrating the commitment of President Gurbanguly Berdimuhamedov in constructing a future for Turkmen people based on neutrality, cooperation , peace and security in a troubled area , is proving a stone decision in making Turkmenistan a power center in Central Asia and a corner of stability in the benefit of Turkmen people development . Second, this it is the most elaborated, complex and fully constructed event dedicated to debate the neutrality status of a country. From Vienna Conference in 1815, when Switzerlandneutrality status was established, such an event of this magnitude on the topic of neutrality it has never being held. This is the first ever conference that discuss and analyze uniquely the importance of a neutrality status declaration and is to offer a complete and elaborated panorama of one the most important and relevant historical documents of the region. Third, this International Conference is a competent and perfect response to United Nations call for preserving and exploiting and offering the knowledge to the world, relating to documents promoting peace, international cooperation and development in the world. Turkmenistan is taking up the call of United Nations and is providing not only a working document and a road map for future countries that want to invoke a neutrality status and to create an area of security but also is offering by such conference a way of scientific analysis the international law base and the geopolitical influence of a neutrality declaration promoting by this way peace and development by culture, and research. Forth I must appreciate the innovative and bold organization of this Conference that is dissolving the usual barriers for such events dedicated to international affairs. As you all know, in the foreign affairs world is underway a well documented and based drive for multi-purpose analyses, for cross cultural investigation, for multidisciplinary approaches and for involving civic society, non-governmental organization , journalist etc. in international events in order to obtain a greater significance and relevance. The time of isolated diplomatic gathering is long overdue and is with extreme great pleasure that I can observe that the International Conference held under the generous auspices of Turkmenistan Presidency and Ministry of Foreign Affairs is responding to this imperative of modern diplomacy. The presence here of diplomats , economic researchers, political figure , important journalists , historians, specialist’s in international law, this is all representing the ideal of XXI century foreign affairs and diplomacy: multi-cultural , multi-disciplinary and coordinate research and policy that could help us create the world of XXI century . 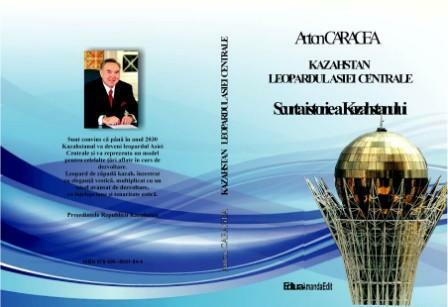 The lesson that this international conference is offering to the world is invaluable, by only reading the list of personality presented here is giving a strong signal of democratization and modernization of diplomacy.Turkmenistanhas understood the lesson of XXI century: openness and international cooperation, may this be a lesson and for other countries. Fifth, it is a tremendous honor and privilege to be invited to be a part of a complex phenomenon that is transformingTurkmenistantoday and shaping a generous future: The Epoch of New Revival and Great Transformation. This generous concept of His Excellency President Gurbanguly Berdimuhamedov is transforming in the appreciation of all the world not only Turkmenistan, but also is calling to life and to contribution the forces of Turkmen people in offering the necessary contribution to develop a new nation, to rediscover the roots of history and to create on the most solid base: peace and international cooperation. This International Conference is playing his part in this milestone event ofTurkmenistanand the world: The New Revival of Turkmen people on basis of peacefulness, humanism and openness. We are all here in a country:Turkmenistanthat could proudly say that is a reservoir of humanity and is hosting the roots of civilization. During the years from this country has started important initiatives to stabilize the region and in service of development and cooperation, but the decision from 12 of December 1995 to declareTurkmenistanas a country of permanent neutrality status is really a decision that changes the face of Central Asia. The neutrality of Turkmenistan is creating an area of peace in Caspian Sea region , is securing the energy route’s, vital to Europe and Asia, is creating a corridor for free transit of goods, ideas and is assuring in our modern times the revival of Silk Road . In an area plagued by dangers and instability the decision of promoting positive neutrality is insuring stability and an island of freedom and development as a model and a hope not only for this region but for the world nations. By a simple but revolutionary decisionTurkmenistanchosen neutrality over tacking sides, peace over adventures, development over poverty, democracy and cooperation over confrontation and today is reaping the positive consequence: the high appreciation of international community. There are many other important achievements and points that are making this event a millstone in diplomacy, not only for the region, but also for the promoting peace and international cooperation. It is a pleasure to be a part of an event that will be remembered as the starting point of a complete analyses and research of one of the most important decisions:Turkmenistanneutrality. Turkmenistanneutrality has not revealed all his political, diplomatic and economic repercussion, but today we are entering in a new realm of political research, we are entering in the world of people ofTurkmenistan, may we all come out with the richness of peace in our hearts. Seeing you all here, important personalities , key figure of the world of today and tomorrow , being a part of a historic moment I can only say to you that we can all be proud and say : I have being in Ashgabat along side Turkmen people in celebrating neutrality and peace. I have seen history in making. Congratulation and perfect congress, I wish you all. You are currently browsing the archives for the Turkmenistan category.